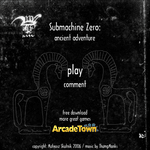 Submachine 0: The Ancient Adventure (or Sub0) is the prequel to the main Submachine series. This game is a lot shorter than the other games in the series and only features 18 screens, this is because it was an entry Mateusz Skutnik made for the JayIsGames flash games contest. Also because of this, it might not be directly related to the main plot, however to a point it can be interpreted through the information found in the main plotline. For instance in Submachine 2: The Lighthouse there is a reference to Murtaugh looking through ancient ruins in one of the notes left behind, this may be the game version of Murtaugh's discovery. Also in Submachine 5, the player revisits part of the ruins to get a crystal of wisdom (which was actually in the same room as the first time you find it! ).In S.N.E.E. (code 103) the temple was also there. Source: Submachine Wiki, "http://submachine.wikia.com/wiki/Submachine_0:_The_Ancient_Adventure", available under the CC-BY-SA License.